Derek Taylor may have scored the sweetest internship of all time. In 2008 he started as a driver for Kentucky-based gourmet shaved-ice franchise Kona Ice. 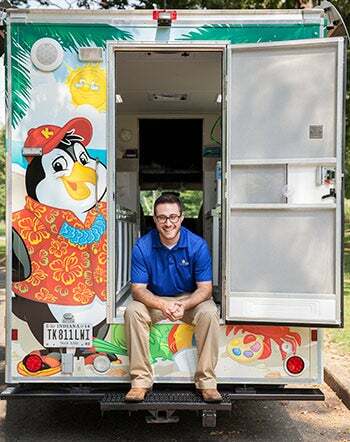 For the next five summers, while earning his bachelor's degree and master's in architecture at the University of Kentucky, he returned to the internship, gaining experience managing trucks and accounts and eventually going on sales calls for the franchise, which brings its shaved-ice trucks to fundraisers and other events. "I feel like intern has a negative connotation, like mail boy or getting coffee," Taylor says. "Whereas I was getting to interact on a daily basis with Tony Lamb, the company CEO, and other executives. Getting that one-on-one time with those types of people helped me blossom and pursue my own personal goals." But experience--and $10 an hour--wasn't the biggest reward Taylor got from his summers slinging ice. Each year of his internship earned him credit toward his own Kona Ice franchise; this past year he cashed in and began running his own trucks in and around Evansville, Ind. We asked Taylor about his ride from intern to franchisee. What did the internship pay for? I was the company's first intern, so they were still working out the program when I started. I know now that after two summers, interns get $8,000 toward a Kona Ice truck. I was compensated roughly $4,000 per year. My internship equity covered my entire franchise fee, and the rest went toward my truck. Why are you doing this instead of looking for a job in architecture? I decided a couple of years ago that when I graduated I would pursue Kona Ice for a while. Being only 24, I have a lot of friends who still haven't started their careers--they're waiting tables or working at phone banks. They don't have the opportunity to take control of their career or destiny. That was what was so attractive to me. This gives me the chance to pursue my personal goals and ambitions. So, are you a shaved-ice careerist? Judging from the reaction this year, when I had two trucks fully booked all summer, I think Evansville can eventually support five units. I think we can get into the convention center, Frontier League baseball stadium and the zoo. I think Kona Ice is a springboard for my future, and it's creating a base to further my career elsewhere. Eventually, I'll find someone similar to myself, set them up running my Kona Ice operations and give them the same opportunity I had. I was given a great chance and want to give someone else a similar experience. My parents definitely had some initial hesitation about my plans. It's hard to explain Kona Ice to someone until they see the truck and how the community interacts with it. I don't think they understood what it was all about until two and a half years ago, when I took them to corporate headquarters. Then they realized this is not just a guy in some ice-cream truck. It's an established, thriving company. Seeing the brick-and-mortar part really made it pop for them. After I'd given my dad the spiel about Kona and sold him on the experience and philosophy, my parents and little brother bought their own territory next to mine. But they haven't really developed their business, because I recruited them to work in Evansville this past summer because we couldn't keep up with the demand!